Nearly 300,000 people have been evacuated from southern coastal areas of Bangladesh as a cyclone dubbed Mora made landfall Tuesday morning local time. "More people were still waiting for evacuation," said Abu Syed Mohammad Hashim, acting director general of the country's Disaster Management Department. Authorities have also shut airports and ports in the regions expected to be worst hit. Residents were seeking shelter in schools and other safe buildings in 17 coastal districts, Hashim said. Officials have organized 3,800 relief centers ahead of the storm. Medical teams have been formed and doctors and nurses have had their leave requests canceled in anticipation of the storm's landfall, according to Bangladeshi state media. Hashim told the state-run news agency BSS that rescue teams comprised of members of the armed forces and other agencies were also on standby. Mora was forecast to make landfall near the southeastern tourist city of Cox's Bazar and the seaport city of Chittagong, the Bangladesh Meteorological Agency said. Mora is the equivalent of a strong tropical storm and will bring winds around 120 kilometers per hour as it moves onshore, said CNN meteorologist Taylor Ward. A more significant problem than the winds will be the potential for flooding -- from storm surge and heavy rainfall, he said. "The coastline of Bangladesh is very low-lying and is prone to storm surge problems," Ward said. "Additionally, tropical cyclones in the region bring extremely heavy rainfall which often turns deadly in the densely populated areas." Some low-lying areas of Cox's Bazar are already underwater due to an unusually high tide, state media reports. The country's two main seaports in Chittagong and Mongla have suspended container handling, and river transports across Bangladesh have been suspended. Chittagong and Cox's Bazar have been advised to hoist the number 10 warning signal -- the highest level -- and other areas the lesser number eight signal. The airports of Chittagong and Cox's Bazar have also been closed; Cox's Bazar indefinitely and Chittagong's Shah Amanat International Airport until at least 2 p.m. local time (4 a.m. ET) Tuesday. "We will reopen the airport if weather permits after 2 p.m. tomorrow... the suspension period will linger if the brunt of cyclone badly affects our airport infrastructure,"
CAAB flight safety director Ziaul Kabir is quoted as saying. 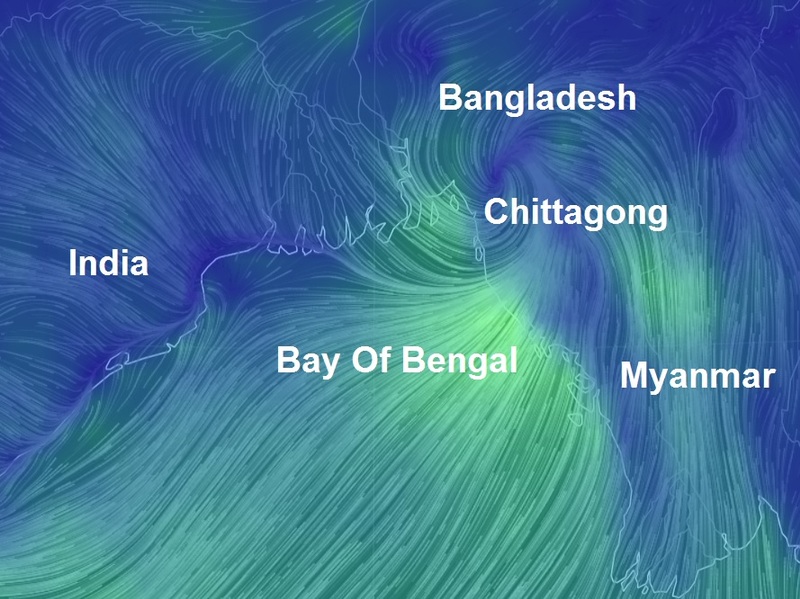 With about 700 kilometers of coast line, Bangladesh is exposed to cyclones and is often battered by deadly storms.